“At a time of such dissent and dissatisfaction in our country, this gives us the chance to go back to our roots, and look at the people who stood up for their causes and beliefs, whether they were popular or unpopular." The nation’s second president will be part of the U.S. currency for the first time on May 22, 2007. QUINCY – John Adams spent and saved a treasury’s worth of money in his time – colonial-era British coppers and shillings, early American “Liberty” cents, quarters and silver dollars. The nation’s second president will be part of the U.S. currency for the first time, on a newly minted dollar, and adults and youngsters in the Quincy area will get the first chance to put the coin into circulation. The general release of the Adams dollar will be held here on May 22, with ceremonies at the Adams National Historical Park and exchanges of the coin for paper dollars at local banks and retail businesses. The general release of the Adams dollar will be held here on May 22, 2007, with ceremonies at the Adams National Historical Park and exchanges of the coin for paper dollars at local banks and retail businesses. Other activities may be announced later. State and local elected officials will be joined for the launch by U.S. Mint Director Edmund C. Moy. The event is being sponsored by the City of Quincy, Quincy Partnership, Quincy 2000, Discover Quincy, The Patriot Ledger and the National Park Service. “At a time of such dissent and dissatisfaction in our country, this gives us the chance to go back to our roots, and look at the people who stood up for their causes and beliefs, whether they were popular or unpopular,” Keohane said. He said the sponsoring organizations hope to involve Quincy schoolchildren in some way as well. For students and everyone else, Adams Park Superintendent Marianne Peak said the coin will be “a daily reminder” of Adams’ wide-ranging political and diplomatic contributions. “We’re excited about the opportunity,” Peak said. As a Constitutional Convention delegate, Adams played a crucial role in steering the Declaration of Independence to passage. As an ambassador, he secured the fledgling nation’s first international loans and as president from 1797-1801, he avoided a disastrous war with France. Since most Americans favored a fight, historians say the diplomacy probably cost Adams a second term. He was defeated in the 1800 election by his vice president, Thomas Jefferson. The Adams dollar is the second in a series of presidential coins the Mint will issue over the next decade. Millions have been struck this spring at the Philadelphia and Denver mints. 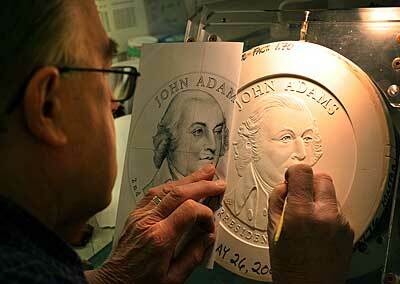 Engraver Charles Vickers uses the selected portrait of Adams drawn by artist Joel Iskowitz to create a plaster 3-D mold which will eventually be used to create a "die" for pressing coins. The George Washington dollar was released on Feb. 15 at New York’s Grand Central Station. Mint director Moy was on hand for that occasion, too. Coins for Jefferson and James Madison will be struck later this year. Four additional presidential coins will be issued in successive years, including a John Quincy Adams dollar in 2008, the sixth president and son of John and Abigail Adams. Quincy-area banks are expected to have ample supplies of the John Adams dollar. The Quincy Partnership and other civic groups are encouraging local businesses to use the coins for change instead of paper bills on May 22 and in the weeks thereafter. From May 22 until early July, the Adams coin will be available at banks in unmixed $25 rolls and boxes of 1,000. Bulk purchases usually include Sacagawea and Susan B. Anthony dollars. All the new presidential coins are made of a golden-hued magnesium-brass alloy over a copper core, the same metals in the Sacagawea dollar. Half the total have been minted in Philadelphia, the other in Denver. When Adams was president, every American coin from the half cent to the silver dollar and $10 gold piece all bore the same design – a Lady Liberty image on the obverse, or front, and an eagle on the reverse.